The INSTEON LED Bulb is an INSTEON controllable light bulb. The light bulb generates light using LEDs (light emitting diodes). The light bulb can be turned on, off, and dimmed using the INSTEON netowrk. The light bulbs come in different packages with different brightnesses and form factors. 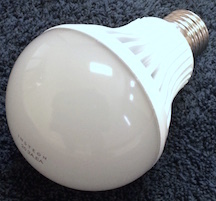 The LED Bulb Device has an input terminal, "1", for setting the light bulb brightness, and an output status terminal, "1S", for showing the state of the light bulb. Brightness values are integers from 0 to 100, where 0 is off and 100 is full on. If the Device is assigned an off value, the light bulb will turn off. If the Device is assigned an on value, the light bulb will go to its last non-off value. So, if the Device was turned off when its "1" terminal value was 50, assigning the "1" terminal an on value will return the light bulb to level 50. Generally, the "1S" status output will track the state of the "1" terminal. However, if the "1" terminal is assigned the value on, the "1S" terminal will show whatever value the light bulb's last non-off value was. If the light bulb malfunctions or is out of radio range, the "1S" terminal will not track the state of the light bulb. The "1S" terminal is useful when one needs to know the actual state of the light bulb. The "1S" terminal will display on or off values in the following 2 instances. When the light bulb's value is 0, the "1S" terminal will display the value off. When the light bulb's value is 100, the "1S" terminal will display the value on.